True Crime has recently become a widely popular topic among young adults and this has created a wide variety of shows, movies, and books exploring the depths of crime accounts in the United States. I have always been drawn to documentaries and articles that touched base on true crime, but, I never thought I’d integrate it into my life the way I have recently, and that’s thanks to podcasts. I’ve listened to multiple crime podcasts in my free time this year, noting “The Serial Chillers Podcast” and “In the Dark” as two very interesting and easy to listen to shows. But, the flow and ease of “Red Handed” compares to no other. It’s based in the United Kingdom and run and edited by duo Suruthi-laya Bala and Hannah Maguire who bury under duvets with their microphones and notes each week and tell the stories of serial killers, grotesque people with hidden fetishes and the out of the ordinary kidnappings and court cases that litter through out not only the United States Justice system but Europe’s as well. “Red Handed” first aired in 2017, but, due to the first three episodes having horrible sound quality, the team decided to delete them in hopes of having a cohesive episode library full of good quality sound. 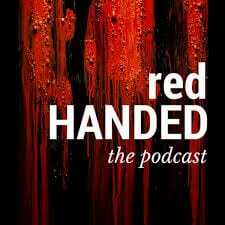 Overall, the quality and time put into “Red Handed” is some of the best I’ve seen, the dedication that both Hannah and Suruthi have to the weekly updates and the detail filled episodes that constantly keep me at the edge of my seat. With all true crime podcasts, there is almost an element of gruesome recollections in every episode. But, the pair takes on those cases with caution and with understanding for listeners who can’t handle the mention of gore. I recommend this podcast for someone with a fascination with true crime while not having a tendency to be squeamish. Despite the good intentions of Hannah and Suruthi, there’s not much you can censor when it comes to crime, so many of their episodes may need to be listened to cautiously. But, overall it’s a compelling podcast that deserves more five star reviews.